Akron, OH – There’s nothing quite like fresh squeezed juice. Its vibrant color, refreshing aroma and pure nutrients are beyond the experience of anything you can buy in a store. But after all the work and time it takes to prepare homemade juice, it only takes a minute for the oxidation process to begin and affect its natural nutrients and flavor. That’s why Zing Anything decided to introduce Pump Fresh. 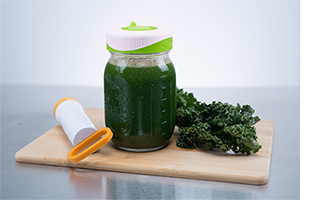 Designed to seal in freshness and extend the life of juice and smoothies, this innovative and easy-to-use product allows you to save time by juicing or blending in bulk. Simply attach the Pump Fresh lid to any standard size mason jar and remove the air with the pump. When you are ready to drink your juice, insert the stainless steel straw and start sipping. The product also works great for preserving sauces, salsas and guacamole – it will keep your “guac” green for days!! Zing Anything’s Pump Fresh package includes 2 lids, 1 hand pump, and 1 stainless steel straw for juices and smoothies. Additional lids are sold separately. All items are BPA/Halogen and Phthalate-free and dishwasher (top rack) safe. The Pump Fresh is currently available online and will be at retailers nationwide for an SRP of $14.99.